These Halloween and fall themed sub plans are perfect for the month of October! Kindergarten students will love these activities and you can rest easy knowing they are busy with meaningful ELA activities while you are away. 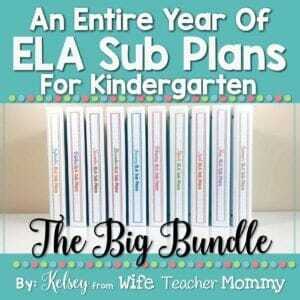 This set of October ELA sub plans can be used as a full day of sub plans (for full day Kindergarten) OR for several days of your Language Arts block. Ghost Themed Thank You Notes to your Substitute(s): These print-and-go thank you notes are ghost themed! They are a half page so you can save on paper and ink. ELA Lessons #2: Rhyming: Sounds -AT and -ICK: Students will do a cut and paste activity to practice rhyming! They will find words to match “CAT” and “TRICK” to keep up the Halloween theme. Includes lesson plan & 1 page of cut out cards and 2 pages for students to sort and paste them. Opinion Writing Lesson: Which Treat is Better? Students will circle whether they think a caramel apple or lollipop is better and explain why. 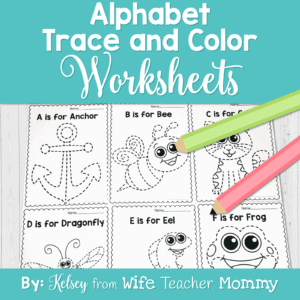 Lesson plan and writing/illustration page included. Writing Lesson: My Halloween Costume: Students will write about their Halloween costume and what they like about it! The writing and illustration page is included. Sequencing Lesson: Students will put the pictures of “How To Carve A Pumpkin” in order and finish a brief sentence for each. Reading Prompts & Lesson: 2 reading prompts are included at 2 different levels. Choose one to use or use both and differentiate! One of the prompts is an informational piece about bats and the other is about a costume party. A lesson plan is included to introduce the topics for each reading prompt as well! Pumpkin Craftivity: This interactive pumpkin craftivity has students draw a picture of their favorite October character and create a guessing game. They will then put it together and decorate it!